Royal Mail launched their latest stamp collection yesterday (22nd August 2017), which celebrate classic and traditional toys from the last century, and all made in Britain. Originally designed to be an exercise device rather than a toy, the classic space hopper has become a firm British favourite. 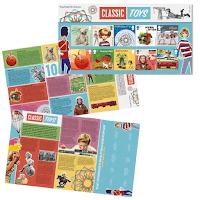 This nostalgic stamp collection feature childhood favourites such as the classic Sindy Doll, and Action Man figures, retro toys such as the Space Hopper and Fuzzy Felt, and of course no traditional toy list would be complete without Meccano or a Hornby Train Set. 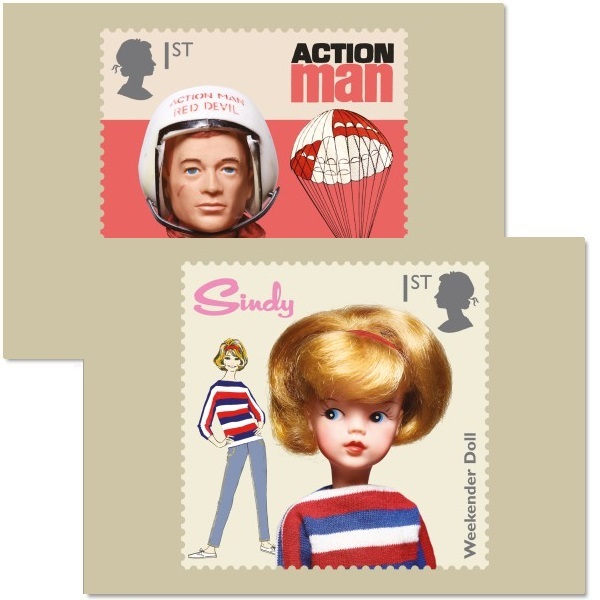 Pedigree Toys Ltd launched the Sindy Doll in 1963 designed by Foale and Tuffin. 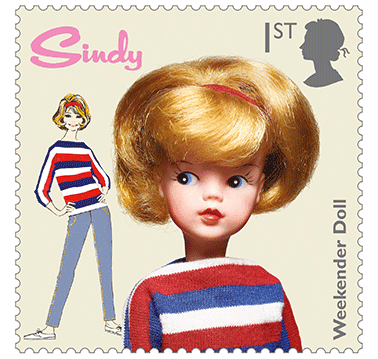 Sindy’s look, fashion and style has gained her millions of fans across the world who regard themselves as true ‘Sindy Girls’. 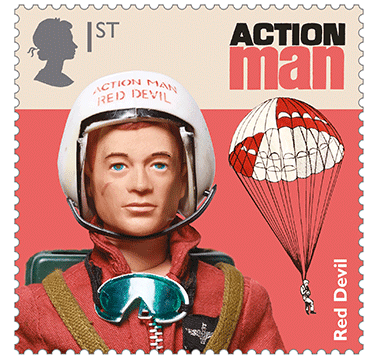 Three years after the Sindy Doll, Hasbro invented the Action Man. 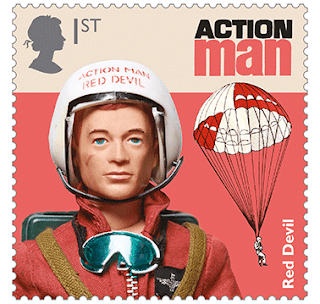 A tough, rugged macho doll targeted at boys. Just like Sindy, Action Man's clothes could be changed. 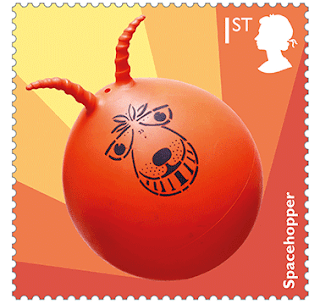 Mine had awesome movable eyes that were controlled by a small lever on his neck. The original Fuzzy-Felt was created in 1950 by Lois Allan. 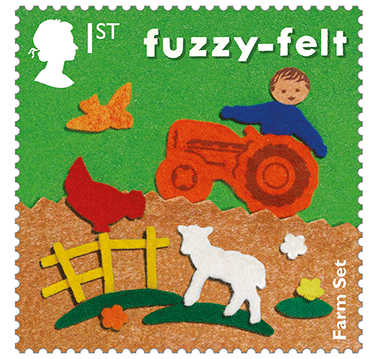 It was comprised of a flocked backing board onto which a number of felt shapes could be placed to create different pictures. 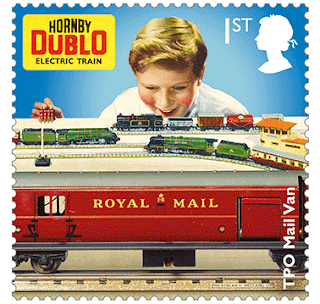 The earliest toy in this stamp collection at well over a century ago, this poular toy was originally marketed as ‘Mechanics Made Easy’ in 1901 but the name was changed to the more familiar Meccano in 1907. 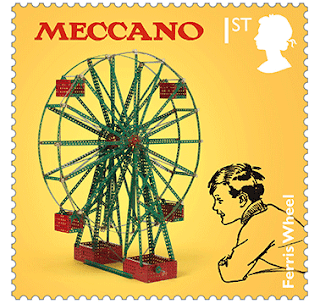 Meccano remains amongst the most collectable of British toy manufacturers. Another Frank Hornby invention,this time he designed and brought to market these scale model train sets, first introduced in 1920. 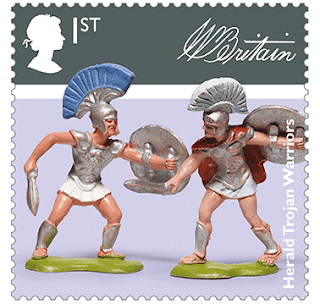 Mostly known for producing lead soldiers, William Britain company made these plastic US Cavalry, Greek warriors and Cowboys and Indians characters. 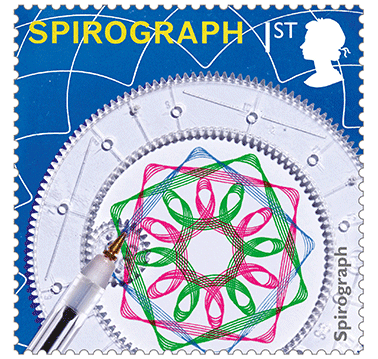 The patterns created with a Spirograph are called hypotrochoids and epitrochoids. Most of us reading this will at some time or other remember sticking a pen through a hole in one of the Spirograph tools twirl it around and watch a pattern emerge! 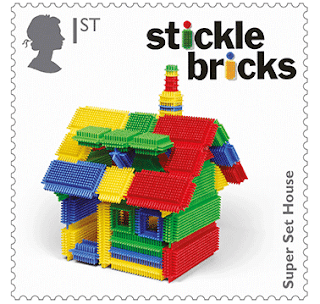 Stickle Bricks were a colourful toy invented in 1969 and intended for toddlers. Many of us will have a special connection with this tactile toy and get very excited when seeing some for sale at a car boot sale and excitedly shout out the name! 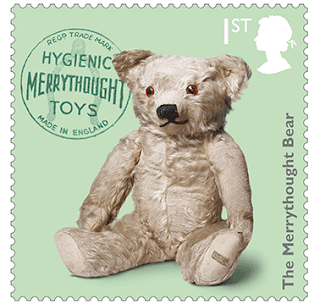 Last but not least, the first Merrythought mohair teddy bear was made by Gordon Holmes in 1930. 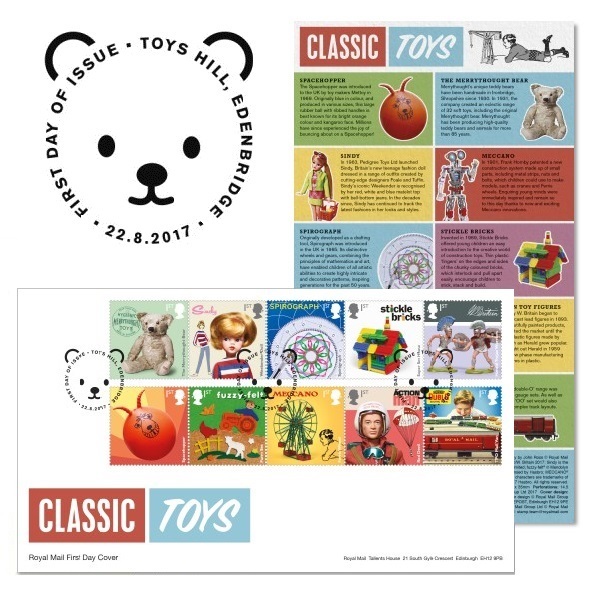 You can buy all of these Royal Mail stamps for a limited time as first day covers, presentation packs or postcards from the Royal Mail website and you can browse and buy traditional and classic toys from the Toyday website.